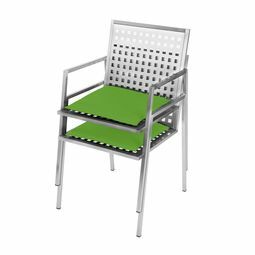 Stainless steel outdoor seating furniture: Stainless steel chairs, sun lounger etc. Relaxation and conviviality is around everywhere you sit well. With outdoor repertoire of L. Heinen Design you provide the highest seating comfort and a cozy feel-good atmosphere for yourself and your guests: Chairs, benches or lounge furniture, stainless and water resistant – from a simple classic to a one-of-a-kind: Find the finest seating furniture for your garden here – timeless, simple, perfect. The classic chair made of stainless steel provides seating comfort in a timeless design. The perfect furniture for your garden. The comfortable stainless steel high backrest chair by Lizzy Heinen makes you experience a summer evening particularly relaxed. The classic bench out of stainless steel designed in the Bauhaus style provides cozy and relaxed times in the garden. Time for stimulating conversations: The dialogue bench made of stainless steel for garden or terrace. [Translate to Englisch:] Probesitzen auch in Ihrer Nähe! Rufen Sie uns an. Full relaxation in a timeless design: Comfortable seating provided by the comfortable lounge chair made of stainless steel. The perfect degree of comfort paired with a timeless design – this is what the lounge sofa out of stainless steel provides to you. Full relaxation in a timeless design: Comfortable seating provided by the comfortable lounge chair corner element made of stainless steel. Aus gemütlichen Minuten im Garten werden mit dem stilvollen Lounge-Ecksofa aus Edelstahl von Lizzy Heinen auch gerne mal Stunden. The perfect degree of comfort pared with a timeless design – this is what the lounge sofa out of stainless steel provides to you. The classy stacking chair made of stainless steel convinces with a high degree of seating comfort and a timeless design. The water-resistant stainless steel table of Lizzy Heinen shines with its full functionality. Design side table made of stainless steel by Lizzy Heinen for the garden, the terrace or the house.